Fans of Nirmala Rajasekar shared a post. "This album deserves wide attention both for its beautiful music and message." We could not agree more! What a BEAUTIFUL review from Songlines... congratulations to the Maithree ensemble: Nirmala Rajasekar (veena, voice) Muruga Boopathi (Indian percussion) Michelle Kinney (cello) Pat O'Keefe (winds & cowbell) Tim OKeefe (world percussion)! And if you haven't done so already, listen to Maithree here: https://open.spotify.com/artist/0rAdVEwwjb9wh4BXb2wfTl 2 months 1 hour ago. Maithree: The Music of Friendship is one of Mundofonias’s favorite albums of the month!! Check it out below 👇 Nirmala Rajasekar innova Recordings 3 months 2 days ago. Fans of Nirmala Rajasekar is listening to Nirmala Rajasekar. Listen RIGHT NOW to Smt @Nirmala Rajasekar’s wonderful All-India Radio broadcast — choose AIR Tamil! http://allindia.radio.gov.in/ 3 months 3 days ago. Check out this review from Jazz Weekly of Smt. 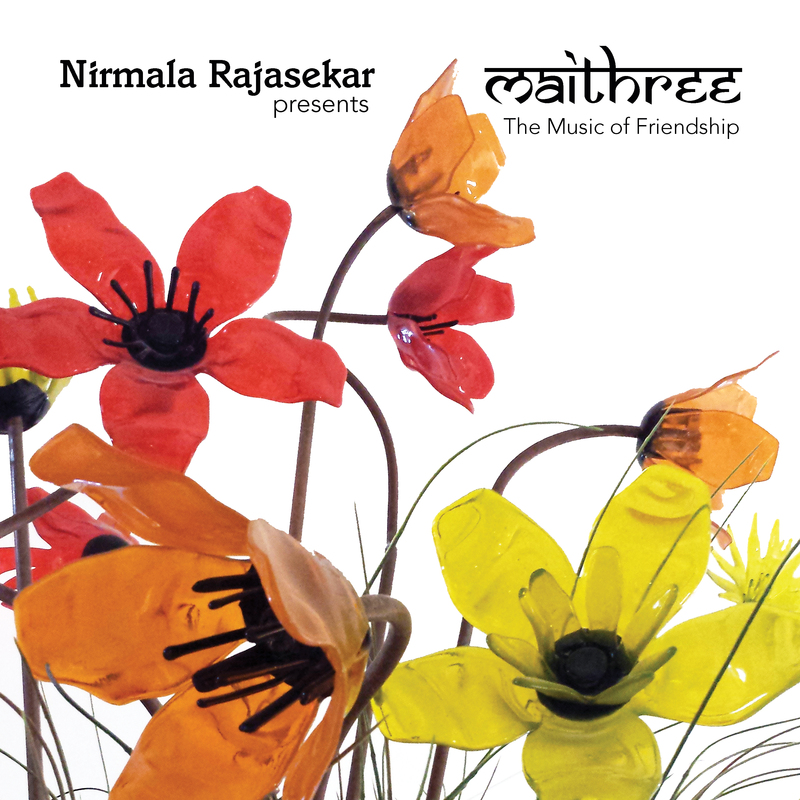 Nirmala Rajasekar's latest album, Maithree: The Music of Friendship! Listen to the album: https://open.spotify.com/artist/0rAdVEwwjb9wh4BXb2wfTl https://itunes.apple.com/us/album/maithree-the-music-of-friendship/1437909057?ign-mpt=uo%3D4 https://www.innova.mu/albums/nirmala-rajasekar/maithree https://www.amazon.com/Nirmala-Rajasekar-Presents-Maithree/dp/B07HBK4HH6 3 months 5 days ago. In Golu played then with students 3 months 4 weeks ago. These are more than just songs. They are a rhythmic, melodic & harmonic convergence of many diverse souls & spirits into one expressive creation. What comes from the heart reaches the heart. The Maithree experience makes our hearts beat together as one. Maithree, the ensemble, was formed when Nirmala Rajasekar, Indian veena virtuoso, invited some friends to play music together. With visiting South Indian drum guru Boopathi, cellist Michelle Kinney, and brothers Pat (clarinet) and Tim O’Keefe (world percussion), this is Minnesota-grown idealism at its finest, where no barriers to musical or social concord get in the way. Maithree, the similarly-named album, features original music, along with new arrangements of Indian, Irish, and Turkish tunes. Maithree, the composition, was originally written for a 1966 concert at the United Nations, bringing a message of world peace and friendship across borders. What could be more timely? Now, more than ever, we need music to bring us together, to remember what we have in common while celebrating what makes us different. Rajasekar has an international four-decade career as one of the leading veena players in the world. A trailblazer in the Carnatic tradition, she is an active collaborator. Her career highlights include the NAACP Image Award for World Music Album with Sounds of Blackness and a Carnegie Hall performance with Butterfly.